So, what’s a Design Page? At Green Lake, working directly with a designer is a lot like having a pen pal, where you’re really excited for the next post. Your Design Page is where you can post images or notes and go back and forth with questions. This is how we get to know you, and understand what’s important for you in your design. Below is an example from an actual client’s Design Page and is what you might expect in collaborating with a designer at Green Lake. 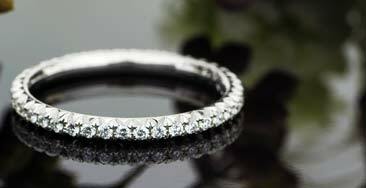 Their dream ring emerged over the course of 100 posts, spanning several months. 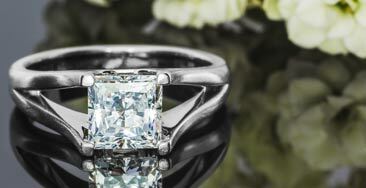 How long it takes to create an entirely custom ring however depends on an individual client’s own discovery of what they’d like created. Still, we tend to quote 6 to 8 weeks from your first post to owning your own original design. 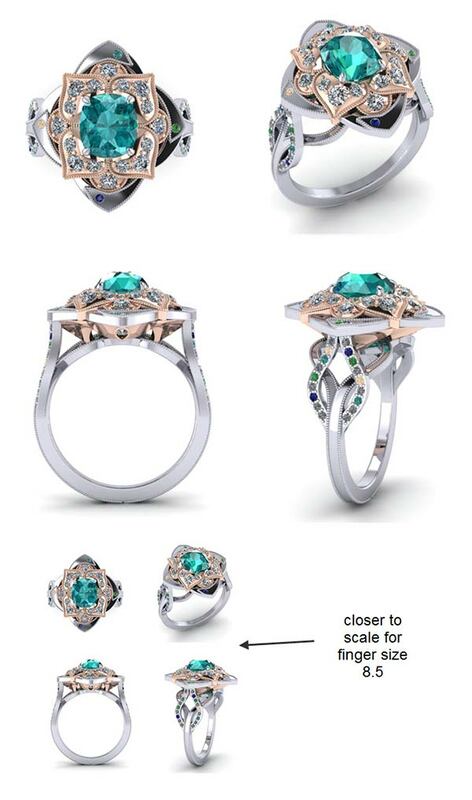 I compiled my own design sheet composed of a few images to inspire my fiancés engagement ring. What do you think? Can you call me directly to discuss? It was a pleasure to talk to you on the phone the other day! 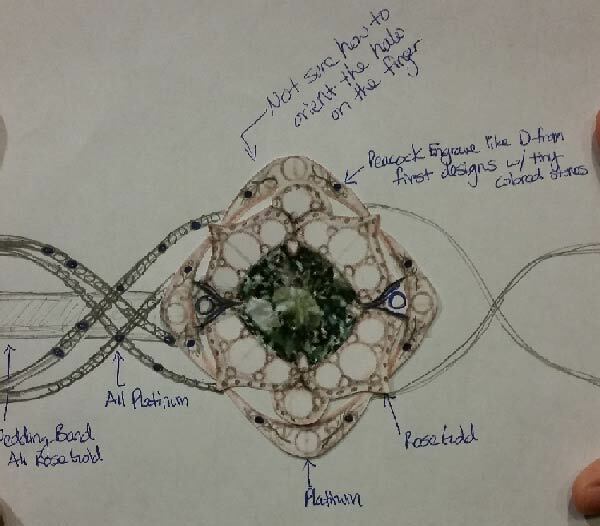 I am currently working on some sketch concepts for your peacock inspired ring. I should be able to post them to you by the weekend (I am out of the shop on Thursday & Friday). Please let me know if you have any questions. I hope you have a wonderful day & I will be in touch soon! We are very excited to see your sketches/designs. I have uploaded the highest resolution image I have of the sapphire. 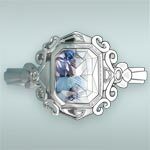 The sapphire can be quite dark if not enough light is allowed underneath it. This is why we wanted an open setting to let light under it and she also wants it raised on prongs since it is quite deep. It does have great color saturation and changes hues depending on the lighting. In fluorescent lighting it is more gray/blue and in natural light it is more green/teal with flashes of blue/gray. Sorry, very hard to describe. 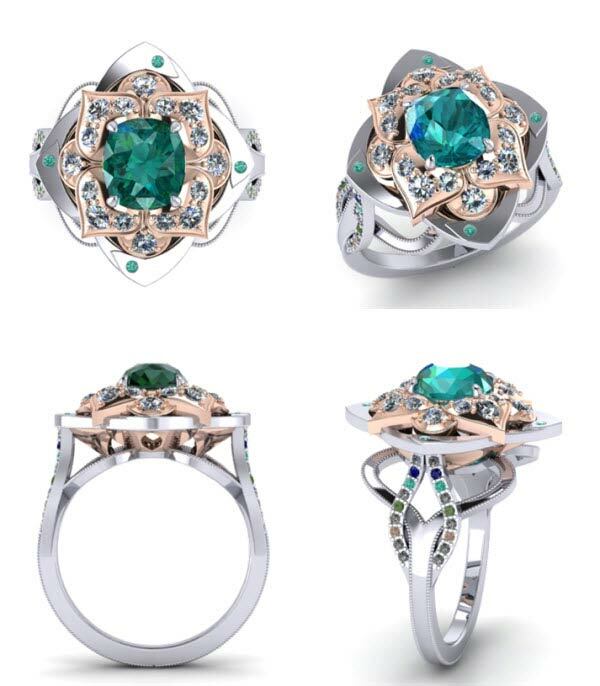 The key is for the rose gold setting and the flashes of green and teal in the irradiated diamonds to bring out the green hue as much as possible. 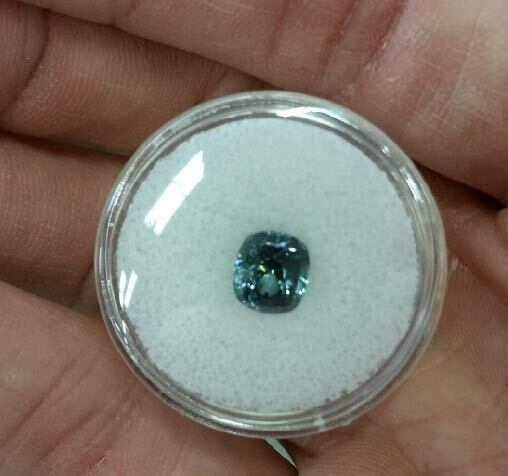 I decided to also upload the picture we took with our phone that shows the color of the sapphire in indoor lighting. Thank you for uploading the additional photos! 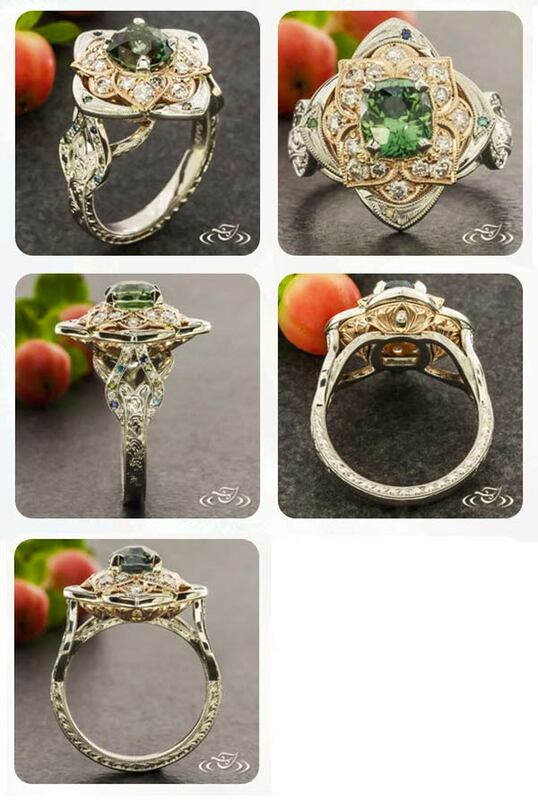 I have attached 4 different ideas for your peacock inspired engagement ring. I was really trying to play more with the overall composition and layout. Then, once I have some feedback from you, we can decide on specific stone color/types and how a wedding band will fit together as a set. 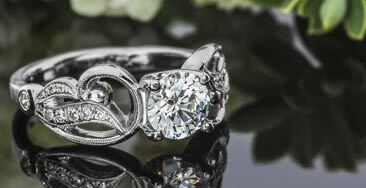 Design B already has a sort of shadow band built into the design, the top wedding band holds two diamonds in the feather strands and the bottom engagement ring holds the center stone in pear shaped halo. Something to keep in mind is how you would like to wear the wedding set; will Jane always wear the engagement ring and wedding band together? A 'puzzle' style shadow band may look as if it is missing a part when worn by itself. 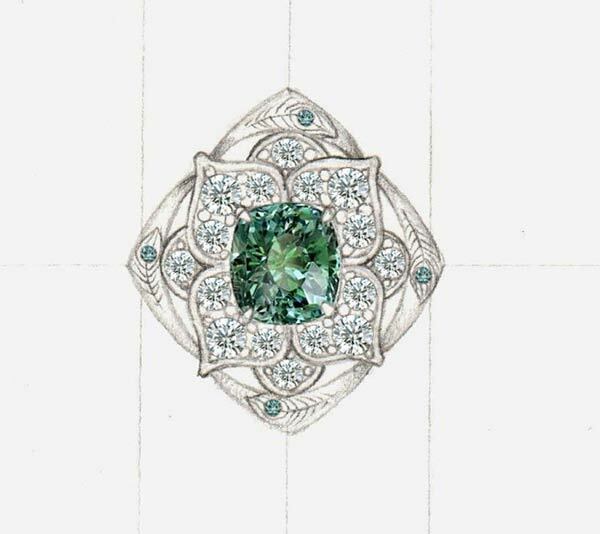 I imagined a sort of 'floating' halo design for B & C, in which there is some negative space between the center stone and the accent gemstones of the halo. 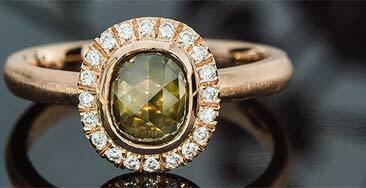 A very rough estimate for these designs in 14kt white gold or platinum would be ~$X-X (using both your accent diamonds and Green Lake provided colored stones). There is also an additional $X customer provided stone setting fee for insurance purposes. Please let me know which design you would like to continue working with and if there are elements from others that you would like to incorporate too. After we work out the exact design details I can give you a more precise estimate based on the complexity of the design, labor and materials needed. I look forward to hearing your thoughts, please feel free to call the shop if you have the time as well. I am in today until 6pm and tomorrow from 10-5pm (PST). I think it would be best to do a conference call with the three of us. What days are you in the office this week? Overall the designs are beautiful! However we are looking for more what was in the original design sheet and I want to get you on the phone with Jane to give to u a more clear direction of what she wants. Maybe I can call you in the afternoon one day this week and I can grab Jane on the call as well. I can chat any time before 4:00pm today, otherwise I am off this Thursday and Friday. We can schedule something for Saturday (10-6) or Sunday (10-5) if you prefer. We will call you around 3 pacific today. If you aren't available we will circle back this weekend. 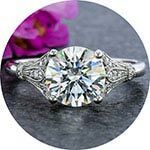 Here are 5 halo designs using predominantly your stones; I only needed to account for Green Lake providing a few extra small diamonds in Designs B & C to fill some gaps. I wanted to start with just focusing on the halo portion because I thought it would be easier to break the design steps into parts rather than trying to go at it all at once. 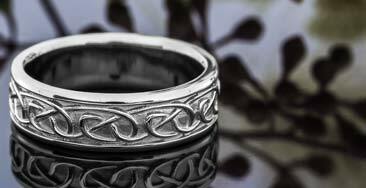 After we have narrowed down the halo portion I can work on some band designs to integrate a pierced braided shank. 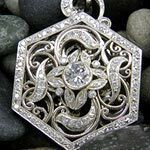 Design A has an engraved halo in a sort of sunburst floral pattern; each of the 4 teardrop shapes is set with a diamond. 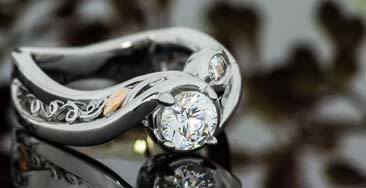 Design C has an outer halo with a flush set accent diamond in each point and scroll engraving. To give you an idea of cost, these halo’s designs as of now (with a simple plain shank) would range around $X-X. If we were to add two tone (rose gold) to the design it could add to the cost from around $X – X. 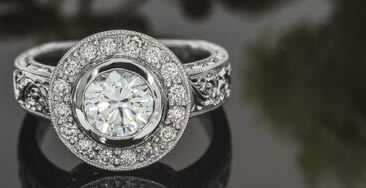 We really like two of your designs for the halo, both C and D. However, we don't love the circle orientation of the diamonds in the inner part of C. What we do love is if you could put D into the outer part of C. Then there would be room for engraving but still be using lots of my own diamonds. I realize that some of the details in the outer part of C would have to be removed to accommodate the outer part of D. I hope this all makes sense. Also, I wanted to let you know that I LOVE your feather engraving pattern on the band of D from your first designs, the one with the little stones in the eye of the feather. I was thinking that would be beautiful in the outer part of the halo in C, now combined with D.
Here is the design for the halo based on our phone conversation and your previous post. I hope I caught you before you leave town! I will get started on some options for the band design and post them to you this week. Please let me know if you have any questions! Wow, that is beautiful! We have no more suggestions on the halo. Love it. We look forward to your band design. We were lucky and found WiFi on our vacation today. Not sure if we will have WiFi next until Sunday. We are very excited and appreciate you adjusting your designs to what we had envisioned. Here are four designs for the shank/band of your ring. 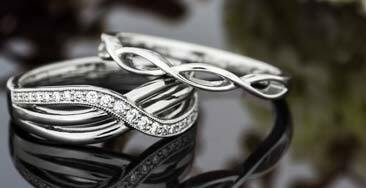 A B & C are braided twist design and D has more of a floral motif to expand off the center halo. I played with some stone options for the bottom three designs, using blue sapphires, teal blue diamonds, dark green diamonds and chocolate diamonds. Please let me know what you think! 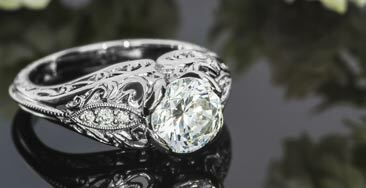 To give you an idea of pricing, as a base the designs A-D in 14kt white gold would be $X or $X in Platinum. 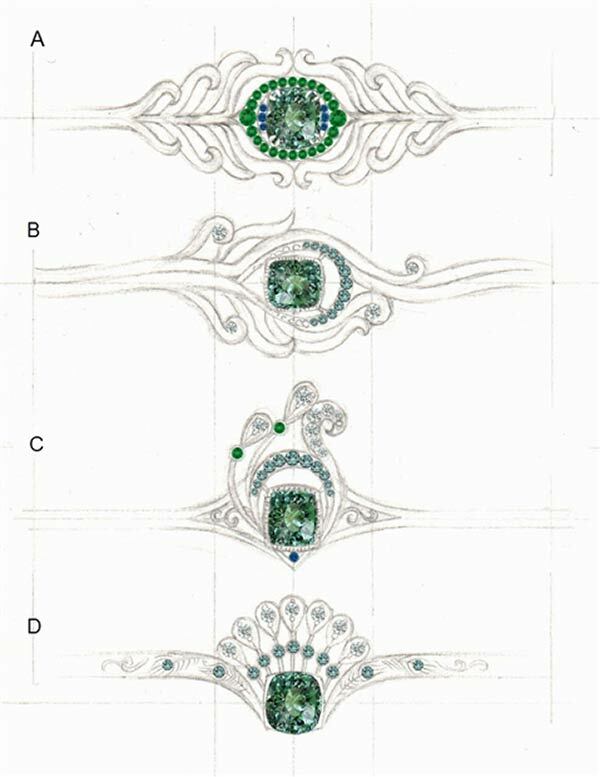 If you were to add colored accent diamonds and sapphires on the band, like I have illustrated in B, C & D it would add ~ $X to the overall price. Please keep in mind that like A, the other designs could be simplified (less stones) or have a clean band with no colored accent stones. Once you decide on which direction you would like to take, I can work on some more sketches in color and of a side and three quarter view! I look forward to hearing your thoughts Please let me know if you have any questions. We'd like to do a call with you sometime tomorrow to discuss pricing and details of how we can get all the features we want within our original budget. 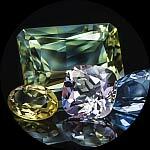 What is the anticipated grade and clarity for the 4 Green Lake provided diamonds? 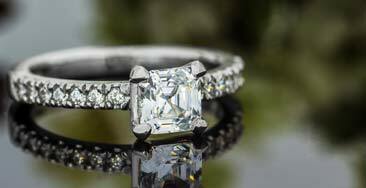 What grade and clarity are you considering for the accent diamonds on the shank? Is there a big difference between 14k and 18k white gold? What options can we discuss to keep to our original budget and still get the two-tone? I can talk on the phone today between 3-6pm (I believe you are 3 hours ahead so 6-9pm). Please let me know what time works best for you so I can make sure to be available. I look forward to chatting with you both! -(16) ~1.0mm irradiated teal, green and brown diamonds, (20) white diamonds (Green Lake provided G-H, SI clarity), (4) blue sapphires bead set along braid. Please let me know if you have any questions about the design and feel free to give me a call. I am in the shop today until 6pm and back in this Saturday from 10-6. We would like to discuss the options you've outlined and we have some ideas which we hope will help guide you on the band and how we envision it. I have attached two photos. 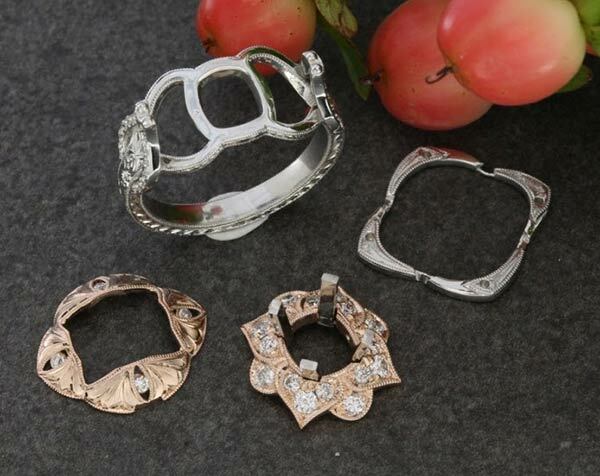 One is to show the 14kt rose gold and platinum metal types paired with the stones. 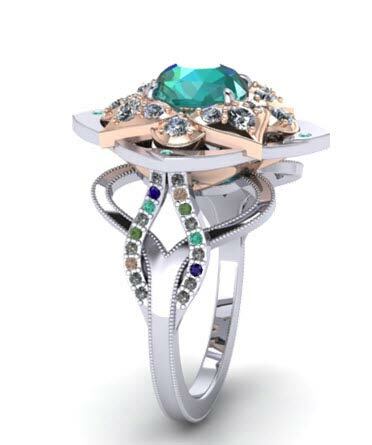 I included your Montana sapphire, some white diamonds, brown diamonds, irradiated dark green diamonds, irradiated teal blue diamonds and blue sapphires. The two photos are a bit different, one using spot lights (left) and one with the natural room light with a long exposure (right). 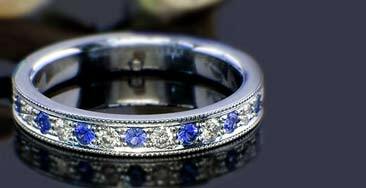 I do think that the metal types compliment the Montana sapphire really well and helps to pull out both the greens and blues of the stone. Designer, thanks for the pics. They were very helpful. It definitely reaffirmed that I like the rose gold highlighting the sapphire. 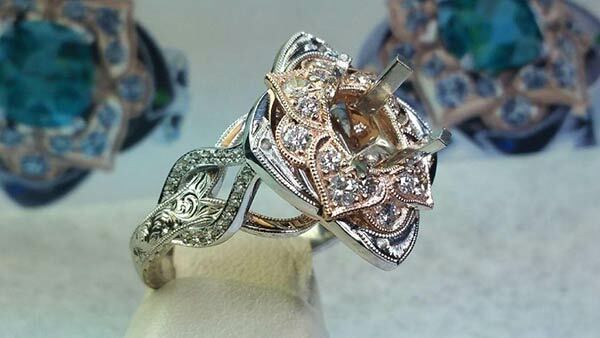 14kt rose gold and platinum mounting $X + $X customer provided stone setting fee. Please let me know if you have any questions about the design! We definitely love this. I just have a few comments/requests/questions regarding details. 1. It's hard to tell from the side profile, but the milgrain bands, will they still curve out until they meet with the bottom of the under gallery? I definitely want the curvature but I was just wanting to make sure it works that way. Maybe even more pronounced curvature of each band, even the one with stones. However, I am thinking that would add more metal and thus, be more expensive correct? 2. 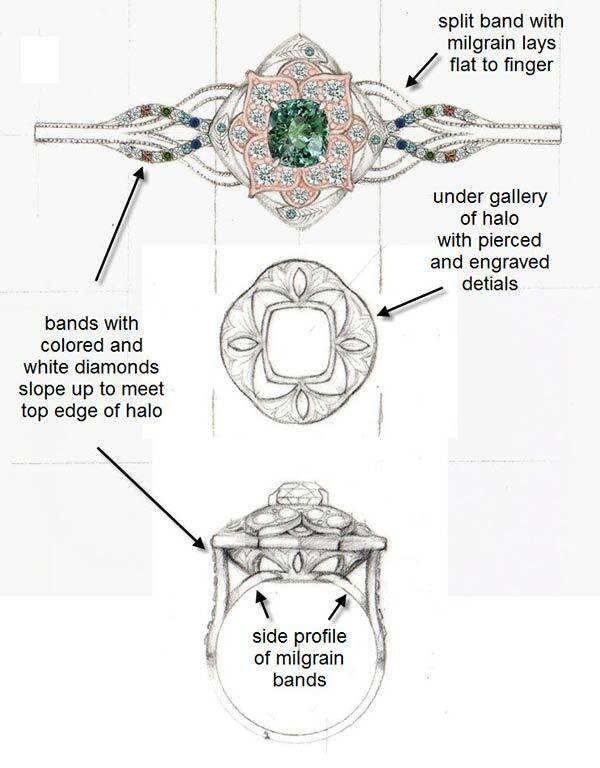 I know the jeweler said that the best way to do this would be to cast the outer halo and the under gallery together. However, we think the under gallery would be beautiful in the rose gold. Would it be possible to cast the inner halo with the under gallery? Maybe making the under gallery smaller so that it meets the inner halo such as connecting the under gallery to the 4 smaller rounded petals? Would it be less detailed if we did it that way? 3. Would it be possible to put any gems on the side of the under gallery, anywhere? 4. 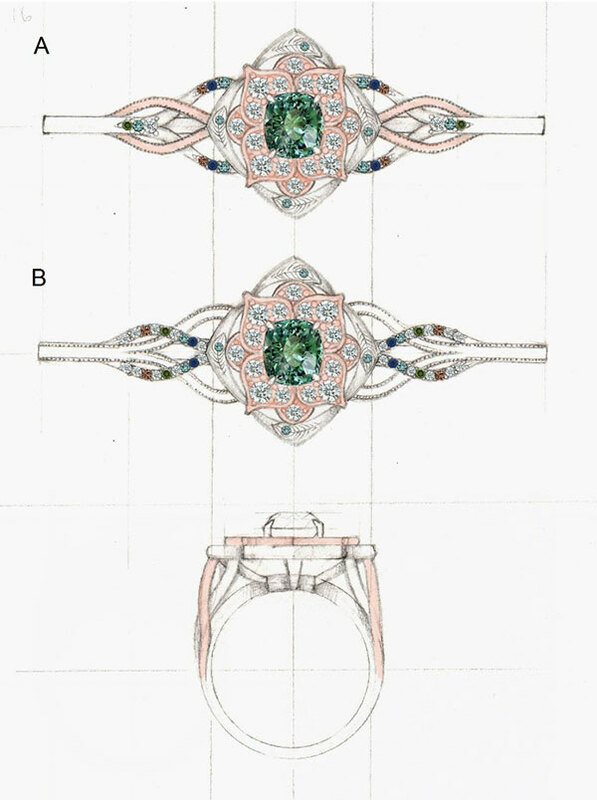 I know your sketch will look different once the ring is rendered in CAD but I wanted to clarify some details on the 4 main petals. Can we make sure they will have more of a natural curved shape...meaning the tips tuck down (where they meet the outer halo) but the sides curve up and then back down where they meet the middle? I did not know if this kind of curvature or waviness would mess-up the diamond mounting. Thank you for all your beautiful designs and for making our vision become a reality. I think we are very close to the final version. Have a nice week off! We will speak to you when you return. Thanks for reaching out. Jane and I have been super busy. 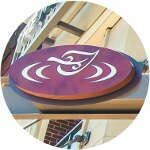 Have you had a chance to speak with the jeweler about out post #36 on the design page? We are looking forward to your feedback and any questions you may have. That's no problem we all get busy sometimes! 2. 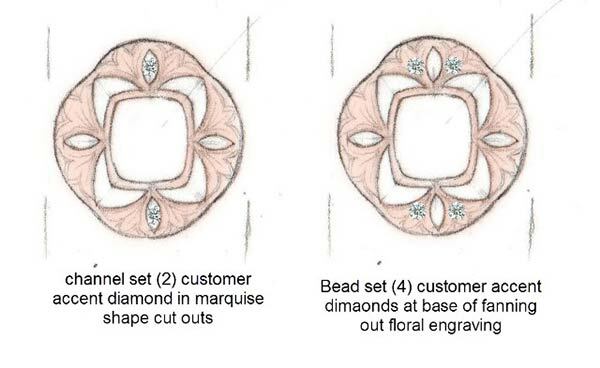 I did talk to a jeweler about some of the questions you had, here is what we discussed: In order to fully support the halo (inner rose gold petals and outer platinum petals) the under gallery must connect to the outer platinum petals. If the gallery were to be made smaller and connected to the inner rose gold petals, the outer platinum petals and braided band would be left hanging out on a ledge without substantial support underneath. If you would like the under gallery to be in rose gold we would need to solder it to the platinum outer halo and do a 4-part casting. For the labor of separate cast pieces and assembly a 4-part casting (14kt rose gold inner halo, platinum outer halo, 14kt rose under gallery, platinum braided band) would add $X to the estimate. 3. You do still have some accent white diamonds which could be incorporated into the under gallery. Keep in mind this will add a bit to the estimate because of the labor involved in setting. Do you know how many you would like to set? 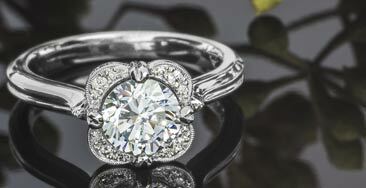 Perhaps just one diamond set in the center of the marquise shape cut out on each side? Please let me know if this all makes sense! I will be back in on Saturday if you have a couple minutes to chat at some point. 1. Perfect. I just wanted to make sure that was clear prior to rendering to save time. 2. Okay, I understand. So the under carriage will need to attached to the outer halo. 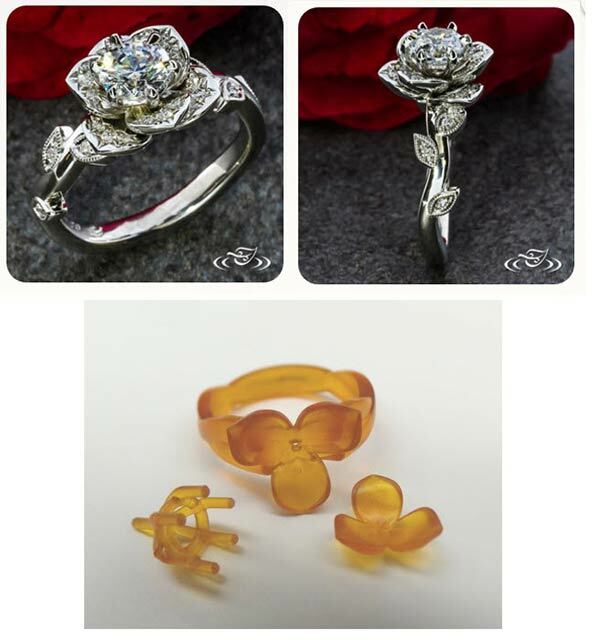 Yes, we want it to be rose gold understanding that it would be a 4 part casting and add cost for soldering. 3. In regards to the accent diamonds in the under carriage, I am not sure where to place them. I guess I will have to wait until the CAD rendering to decide. I don't want them to take away from the punch-out spaces that will provide light underneath the Montana sapphire. 4. I will look for a petal shape and get back to you. Just wanted each petal more 3D rather than flat. I will get started on writing up all of the details for the design. I have sent a payment request for half down on the current quote ($X mounting + $X set fee) to get started on the CAD rendering. 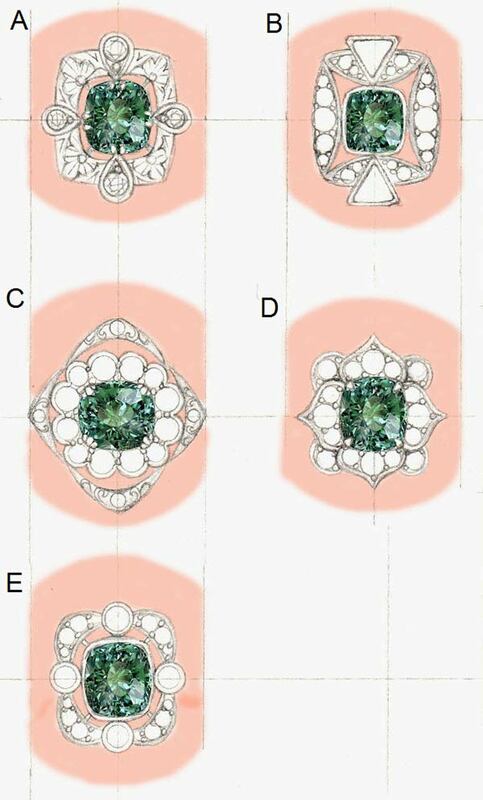 Would it be okay to give the go ahead for the jeweler to carefully remove the diamonds from your rings (this way I can give more exact measurements to the CAD modeler)? Thank you for the phone call today to discuss all this. I've posted payment. We look forward to seeing the progress, please proceed! 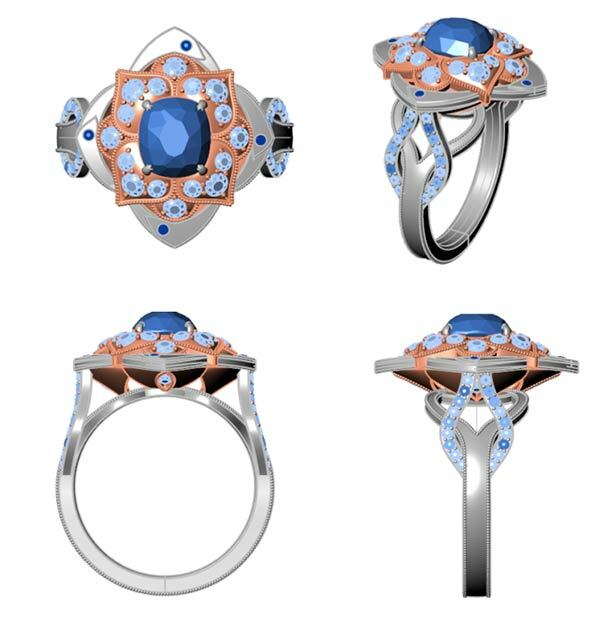 Here is the CAD model rendering for your ring! 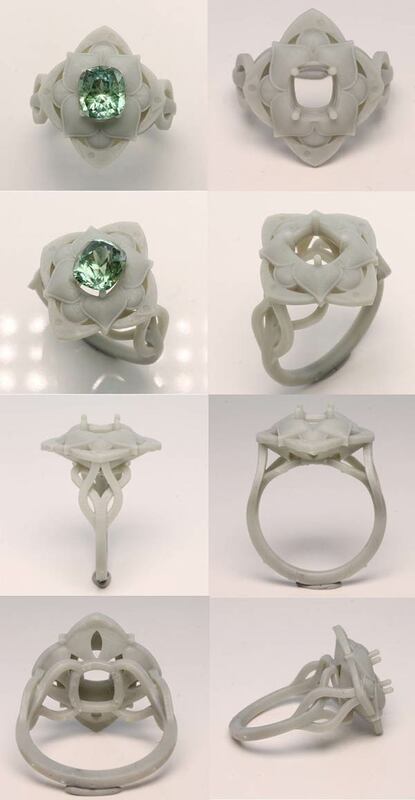 Please keep in mind several things: the engraved details & milgrain will all be done by hand once the ring is cast, the stone and metal colors are more accurately represented in post #32, generally the CAD model looks a bit more bulky than the actual piece because of the enlarged scale. 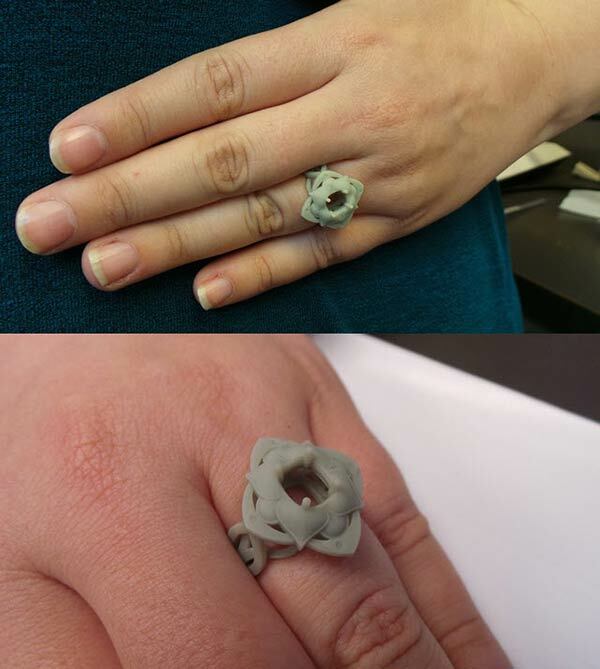 Although this ring will be cast in separate parts we can print a 3D viewing model with the entire piece for you to try on for scale and fit, we can make adjustments at that point too :) I look forward to hearing your thoughts! Please let me know if you have any questions. 1. I think the extra channel set diamonds in the marquise punch outs is the way to go. Can we put these in all 4 marquise punch outs? 2. I am aware that the rendering does not show the engraving but as it is now, it looks very modern instead of vintage. Would adding mill grain to all edges including the petals and the outer halo help? Is that even possible? I am also leaning more and more towards engraving the non-stoned band surfaces, excluding the inside that touches your finger of course. 3. Can the band with gems also curve out just slightly more and the bands without gems curve out just slightly less to be more even? It was nice to speak to you today. I spoke to Jane after our call and here are some bullet points for action items and feedback. If it will save time I'm happy to have a call with you tomorrow to clarify and cover these points though Jane will be unavailable. 1. The 4 gems in the outer halo should be one of each of the four colors from the shank. 2. The split shank curvature should be less on the shanks with no gems. 3. Curvature should be more on the shanks with gems. 6. Yes, we want the 4 stones in the gallery marquise-punch outs. Acknowledging one or two may not be seen as well. 7. Colored stones in the split shank (We want these to be randomly placed such that they are not symmetrical to either side as shown in the rendering from post #46. Let us know if we should provide placement of these randomly to show what we want however we are open to random placement). 8. 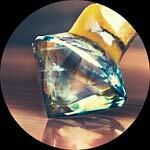 Flower petals: We want the petals around the gem to have depth and look more natural. Currently we feel they look sleek and symmetrical. Jane's post #49 shows petals which we feel have a curvature that shows depth. 9. 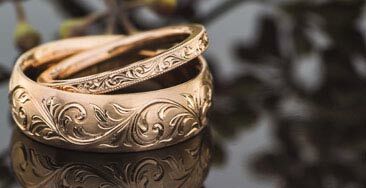 Engraving & millgrain: We want the engraving to show the antique feel of this ring and engraving should be feather-like but is open to interpretation of GLJW. 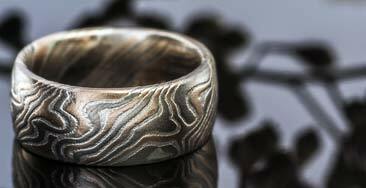 All the blank metal space should have engraving and mill-grain except for the bottom of the ring. We suggest the engraving would go past where the split shanks meet at the bottom. We are excited and look forward to next steps. 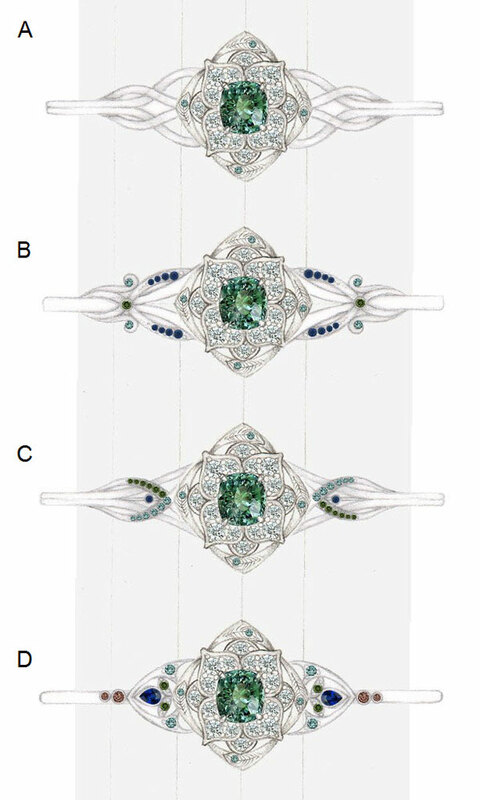 -We can definitively swap the four outer halo gems to be (1) green diamond, (1) teal blue diamond and (1) blue sapphire (1) brown diamond. Did you want the colors paired in a certain way, or is Randomly organization ok? 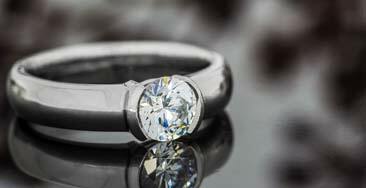 We can make the curvature on the solid milgrained shank less, and the curvature of gemstone shank more. I will let the setter know that you would like the spacing so that and solid metal is divided evenly between the top and bottom. 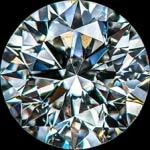 -We can set (4) of your extra round brilliant diamonds in the marquise cut outs under the gallery (+X setting labor). -If you really hoping for the three dimensional look of the flower you posted we will need to make a fairly large revision to the petals. 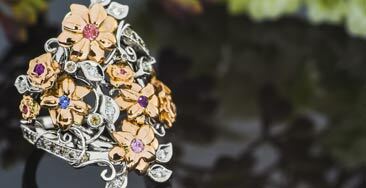 I have attached an image of our 'lotus' ring which has a lot of depth to the petals. The way this effect is achieved is by assembling the petals in layers (top tier with 3 petals, bottom tier with 3 petals). 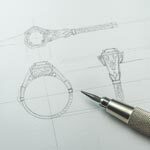 In order for the jeweler to have ample space to maneuver setting tools, the diamonds must be preset in each layer separately before assembling. I have attached an image of the way the separate parts for the model. 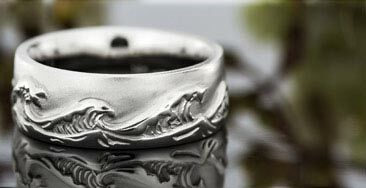 We can definitively achieve this look for your ring, but we will need to add labor for 2 more parts and assembly (+$X). If we were to make this change would you want the petals to for a cup-like form (sloping up as it moves away from center stone) or a dome like form (sloping down as it moves away from center)? -Our engravers are really talented and excel when elements are left up to their artistic interpretation :) I am sure they will do a wonderful job on the peacock feathers. We can engrave on top half of the split shank, however that was not included in the original quote, please let me know if you would like an estimate! 1. Yes, random assignment of the four colors on the outer halo is perfect. 2. The randomness that you have below for the split shank gems is perfect. 3. I like the petals where they are at but I don't want the edges looking so sleek. That is why I was asking about adding the mill grain to all edges as is shown in the lotus ring I uploaded in my last post. I just don't like the sharp sleek edges. This is also true for the outer halo. 4. Yes, the engraving on the band is something I have been wanting but we were waiting until the rendering to see if we really needed it. At this point, both John and I agree that we need the engraving to make it look vintage and not sleek/modern. I am definitely open to creativity on this engraving part, but would like some idea/sketch to come from the engraver prior to finalizing the ring. 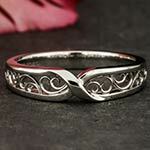 Therefore, yes, we would like an estimate for the additional cost of then engraving. Just to be clear, the peacock feather engraving in the outer halo and the engraving/texture in the gallery were already included in the initial quote correct? Also, does adding mill grain count as engraving? If so, what we need an estimate on is engraving of the split shank on the outer part that then turns into the top, as well as the sides of the shank. Can the sides of the shank be textured or engraved? This would also include all the mill grain. The only surface to not have engraving or mill grain is the inside of the shank and the lower part of the shank past the split. Does this make sense? If not, we can definitely find time for a call late this afternoon. Here is the updated CAD rendering! The color I have shown a scaled down version to give a sense of the ring closer to actual scale. Of course the best way to see the proportions will be to try on the printed model in person :) We can always make changes at that point too! 1. Will the mill grain on the outer halo at the feather engraving part interfere with the engraving, meaning will it limit the detail for that engraving? 2. The color is looking yellow for the brown stones. Just wanting to make sure we still have brown and not yellow. Also, I love the four colors on the outer halo and the random orientation on the band. Perfect on that. 3. Perfect on the curvature of the split bands. 4. I think I want to stick with the 2mm as is and try to find an engraving pattern that will work in those confines. I don't want to bulk it up too much. I have uploaded a few images of what I am looking for the engraving. I am not looking for perfect replication but just wanted to give you an idea. Still want the engraver to be creative. These examples also have the side engraving like I love and I was thinking about in my head. 1.The milgrain will serve to frame and accentuate the feather but there will still be all the engraved lines to detail the actual feather. 4. I can definitively print these sample images of scroll pattern and pass them on to the engraver to be reinterpreted for your ring :). 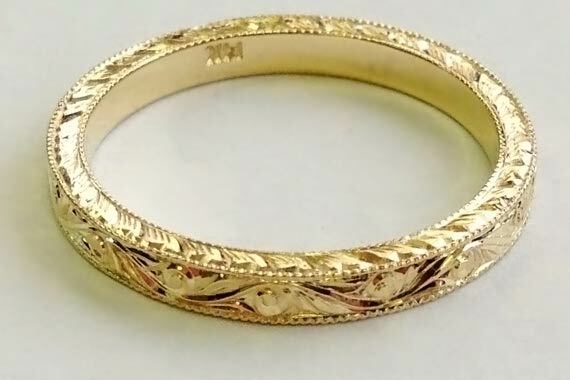 It looks like several of these examples have ‘half wheat’ pattern engraving on the side face of the band. To do side face engraving we need about 2mm thickness of space. The model has enough thickness at the bottom ½ of the shank, but it becomes more thin and delicate at the split, so the engraver would not be able to fit the same level of detail at the top of the shank. I would really like to wait until the model is printed/grown to show it to an engraver before confirming we could engrave on those side face surfaces. We might just be able to do some really simple line work in those parts. I know you love the look of engraving all over so we want to make it work for you! I have worked up an estimate for the additional elements we have added since the last quote. I hope you are having a good start to the week! Yes, all sounds good please proceed. Here are some photos of the viewing model from different angles! I also had a coworker try it on to show you scale on the hand :) Your Montana sapphire was placed in the mounting, it will sit lower once its set and the prongs are pushed over. I showed the model to your jeweler and he said that we should be able to do some simple bright cut line engraving on the side face where the lower shank splits off :) He did recommend that we increase the shank width a bit at the base (~.5mm more) to give a bit more of a counter balance to the weight of the halo on top. What do you think? And yes on making band wider. How much will that add to the cost? I can ship out the model to you tomorrow! We use USPS for the wax models so it may take a couple of days to arrive. I hope you had some fun trick-or-treaters yesterday! The model was shipped out today, I can't wait for you to see it! Thanks for the notification. We are very excited to see the model as well! 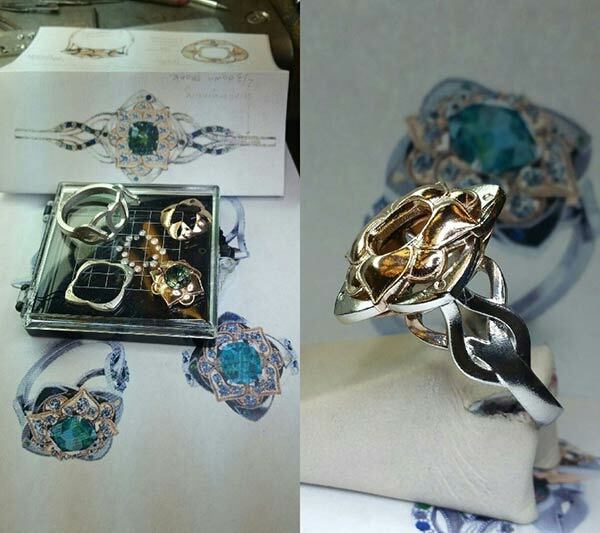 I loved the model pictures already so I can't imagine how it will look when it has all the stones and the engraving. We received it and it looks great! It is beautiful. That's wonderful! Please let me know if you have any questions or thoughts. Jane felt like the band was slightly dainty. She wasn't sure if it was wide enough at the bottom. She didn't want to add too much weight but just wasn't sure but she feels like it would be nice to thicken .5mm on the split shank and widen 1 mm on the band. It does fit well in terms of size. She agrees with your engraver this would help to give space for engraving. Do I need to send the model back to you? It is hard to compare this rendering to the previous since it appears to be larger. I think it looks great, just want to make sure we are all on the same page. Just want to make sure that the entire band before the split was widened by 1mm and then all four split bands were subsequently widened by 0.5mm. In addition, I agree that the split bands should also have 0.5mm added to the depth/width as to allow the side engraving. This rendering below looks like all these things were included but I just wanted to make sure since it appears like a bigger image overall. Thank you for posting this. Glad to see and hear of the progress! 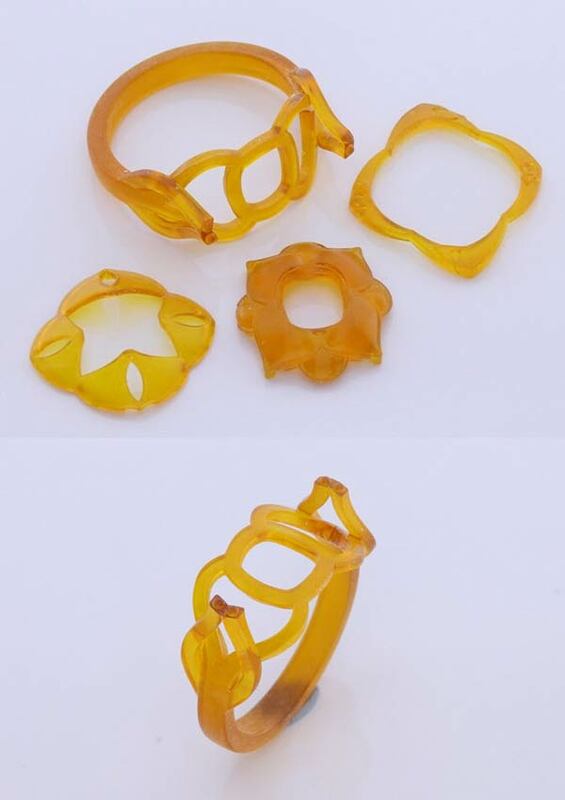 Here are some photos of the ring in process! We are getting close to the finished product ! It looks great ! Thank you Designer for the updates. Your ring is complete! It looks like a true masterpiece :) Your jeweler did a wonderful job with all of the engraving and detailing. Looking at the delicate line work on the engraving it looks like the peacock feathers might just float away in the wind! I have sent the online payment request of the final balance and a more detailed invoice to your email. Please let me know if you would like to try for delivery tomorrow (our pick up is typically is between 3-4pm) or for Friday! It looks amazing! Wonderful artistry. Friday is fine since it is too late to catch today's pickup. I hope you get some good recognition there for your work as well as your team. Awesome I am so happy you like it, and I can't wait for you to see it up close! Agreed I can't wait for us to see it in person. I more than love it. It gave me chills. It is definitely everything I had in my head and didn't have the design talent to put it on paper. We really are thankful that we found you and Green Lake. We were about to give up on my dream custom ring. 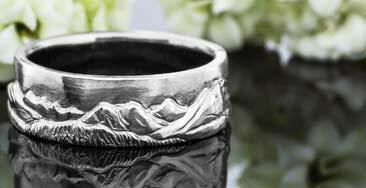 Most places say they design custom rings but this was NOT the case. They customize to prefabricated designs and send out for all the details. 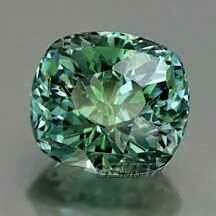 They scoffed at using my old diamonds and a gemstone in the center. You have been amazing and the custom services Green Lake offers is really unmatched. I cannot thank you enough for your patience with us (especially me) through the whole process. Together, we have designed a truly unique ring that perfectly captures me, my personality and all my favorite things. That's wonderful, definitively the feeling we are striving for here at Green Lake! Our shop is a truly unique place and I am so thankful for all of my talented coworkers that I get to interact & learn from every day :) I really admire your commitment to transform and incorporate old stones into a new and meaningful piece to you! Here in Seattle we love to advocate for the Montana sapphires which supports a local economy as well. It was a lovely experience working with both of you, I can tell you both have great respect for quality craftsmanship and the creative process. And your thoughtfulness and ability to collaborate together is a true reflection on your partnership. 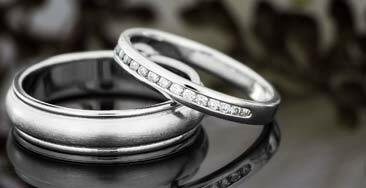 I would be very happy to help you design your wedding bands once you are ready! We have shipped your ring out to the UPS Store. She said Yes :) :) :) She loves her ring! I surprised her within hours of getting the ring in person and so she was not expecting that at all. 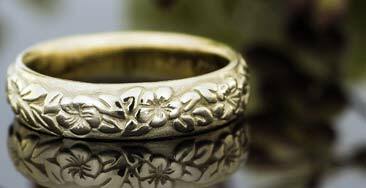 We will absolutely recommend Green Lake Jewelry Works and you and your team to others.